A new version is here. This new release resolve a bug that was discovered and that prevented proper removal on printers that were no longer shared. It also changes some of the plumbing underneath to pave the way for the future. Improved installer. You can now uninstall the application through the installer application. Complete change on how that application automatically start at login. Now uses common Login Items approach. Better handling of cleanup activities if one remove the application from the System Preferences while it is active. Many more under the hood improvements. I know, we are working on properly enable this feature. Keep an eye open for a new release. Works perfectly! It would be nice if it could start as a system daemon, so that nobody needs to be logged in to be able to print from iOS devices. Exactly! That should be the next step in the program. I could write something up even as it’s not too hard to do. This is on our radar. I actually might start to take a stab at it this weekend. Sounds good, let me know if you need any help. Just what I needed! I tried installing 2.2b from a network share, but it would crash so I tried 2.1b7 which worked. I removed 2.1b7, put the installer on the desktop and then it installed without issues. One for the docs. And with 2.2b, duplex printing works with a Brother HL-2270DW Laser. I wish I had access to a few other parameters like Toner Save, Portrait/Landscape, and Scaling, but for the occasional printing I do from iOS, it’s just fine. Thanks for writing this handy utility! This program would be perfect if it wasn’t for the fact that you MUST be logged in. It can’t be that hard to have it start as a system daemon so that you don’t have to be logged in. This is a HUGE downside if you use the computer with other users. Other than that, your program is great. If you can get it to startup as a system daemon then you will have perfected it. Until then, though, many of us will be left unable to really use the software (if we need to log out to conserve system resources). I have the same problem, worked fine until the system update the other date. Maybe it broke it? Just tried printing after updating bot the Mac OS to 10.7.4 and the iPhone to 5.1.1 and all is well. So it must be something else on your end. Has always worked well for me but I noticed that if the “double sided” option is turned “on” on my iPhone nothing prints. Turn it off and it works like a charm. Currently running version v2.2b4 on my Core 2 Duo iMac with 10.7.4 with the firewall on and had to install from the “show contents” start point. Thank you for the feedback. I really don’t understand why the installer fail for some. If you try to run it again and use the update option does it work? The latest release seems to block printing altogether on my Brother laser printer. The previous release didn’t seem to work. 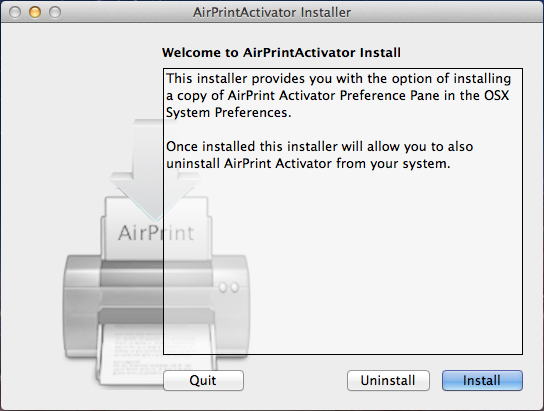 When I uninstall through the activator app I can print again.